This is an adapted and truncated excerpt from my upcoming memoir, tentatively titled Libre: Secrets of a Hippie Childhood. At the end of the day, we’d read. It was our reward for weathering ten hours on a Mexican highway, our reward for surviving the diesel belch of overloaded sugar cane trucks, the potholes, the zipping motorbikes, the maniacal bus drivers, the sudden herds of cows. The sinking sun was our signal to get off the road and begin looking for a place to camp. When we’d found a suitable spot, the old Dodge would roll to a stop and we’d all spring into action. While my mother and I set up our beds in the van, my dad would open the back doors and unload our kitchen: the rickety folding table, the grease-encased Colman stove, the ancient cooler, the folding metal lawn chairs, the plastic bins for washing dishes, the box containing my dad’s beloved spices. And then, the final reward. When everything was in place, and my dad was happily cooking dinner, my mother and I would sigh in unified relief as we pulled out our books and sank into our lawn chairs to read until dinner. After dinner my dad would join us, and we’d read while the sky settled into dusk and the crickets sang and the air began to smell of nighttime. When it got too dark to see, we’d retire to the van, my parents vying for the best light from their single bulb and me with my precious flashlight and battered copy of Anne of Avonlea. I spent a large chunk of my childhood living in a van. My parents were travel writers and small time importers, and eccentricity was their bread and butter. My dad was the co-author of the hippie cult classic The People’s Guide to Mexico and looked like a cross between Allen Ginsberg and Jerry Garcia; my mom looked like Janis Joplin, studied witchcraft, and thought that bras were the yoke of the patriarchy. They were obsessed with Mexico. Every winter we left our drafty cabin in Oregon to drive south to Mexico, where we spent months traveling to obscure Indian villages to buy pottery, jewelry, and wooden masks. In the spring we returned to the U.S. to sell our treasures at flea markets and hippie fairs. Though I’d been living on the road since day one, I never quite accepted our nomadic and outlandish existence. I was embarrassed by our funkiness and I was often homesick, especially when we found ourselves “camping” in strange and lonely places. Books were my constant. L.M. Montgomery’s Anne of Green Gables books allowed me to depart our roadside camp spot for somewhere cozier. With Anne Shirley, I traversed formal parlors, adjusted my starched collar, and sipped raspberry cordial. I drifted through Sunday school picnics while wearing majestic puffed sleeves and attended tea parties with home-baked cookies and plum pudding. In my mind, I was friends with the minister’s lovely and stylish wife, Mrs. Allan, who would no doubt take an interest in my spiritual upbringing. My reading taste reflected a clear theme. 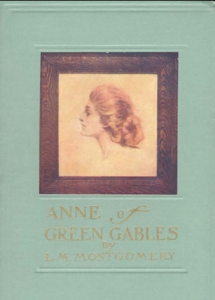 I was obsessed with the Anne of Green Gables series (about an orphan girl who is adopted into a proper middle class home), the Emily of New Moon series (about an orphan girl who is adopted by respectable maiden aunts), and the books of Frances Hodgsen Burnett (about orphan girls who are adopted by rich people). I read A Little Princess ten times. Each time I read the rags-to-riches tale, I entertained the possibility that I too had a mysterious benefactor who would begin sending me anonymous gifts, replacing my shabby wardrobe with the finest fashions. (Suddenly I’d wow my friends by ditching my Mexican flip-flops and Guatemalan overalls for a brand-new Esprit sweatshirt, a Swatch watch, pink Reeboks, a Guess mini skirt and matching acid-washed jean jacket.) When my mysterious transformation was complete, it would be revealed that I was really the heiress to a diamond mine! My benefactor would then whisk me away to a life of luxury. We’d live in lavish hotel suites and subsist on cucumber sandwiches (white bread with crusts removed!) and petit fours (a food I had never actually seen in person). I always finished my daydream with an altruistic flourish—Naturally I’d send money home to my family. My uncle would be able to afford a double wide and my parents could buy all new camping gear! My voyeurism wasn’t limited to the 19th century. I read about modern suburbia with the same avid interest I had for tales of the paranormal. While the van lumbered up a Oaxacan mountain pass, I traversed the halls of Sweet Valley High. Even at age ten I had misgivings about the banality of Jessica and Elizabeth Wakefield, but that didn’t stop me from relishing the details of their middle class lives. The perfect blonde Wakefields jibed with my fixation on what I was not. I did not have “all-American good looks” or an endless closet full of cute outfits. My tangled brown hair was a far cry from the twins’ shiny blond manes, and I just knew that I wasn’t going to grow up to be a perfect size 6. But the Wakefields didn’t make me despair. Quite the opposite. By reading, I could seek haven in suburban homes with spotless wall-to-wall carpeting. As I sat in the backseat of our grimy van while my parents haggled with a woodcarver over the price of a traditional Guerrero devil mask, I daydreamed of Sweet Valley. I complimented Mrs. Wakefield on her home decorating skills. I rode shotgun in the twins’ red Fiat and won Elizabeth’s admiration for my ace reporting for The Oracle. I wooed the boys of Sweet Valley with my sparkling white smile, my perfect bangs, my pristine v-neck sweaters, and my amazing dance moves. It wasn’t that I hated my life. I loved my parents and our van and our funky home in Oregon. I loved camping on remote beaches and waking to the chatter of parrots. But I couldn’t help noticing that we lived on the fringe of society, scrappy outsiders in a dusty van. The other side of life had a glittering allure. Prim-and-proper parlors were exotic. The pages of my books revealed the secrets of respectable people! I thought that if I studied them carefully enough, someday I might become one. You can subscribe to our list and get notifications for LOAKL here. Have a submission for Readers Recommend? Send it to us at info@LOAKL.com with the subject line: Readers Recommend submission.